If you haven’t considered positioning your business internationally, Spanish Language Domain Names will assist you in that strategy. There is great opportunity to create, solidify and grow market positions in the minds of the Spanish speaking consumer worldwide. The table to the right lists the total numbers of Spanish speakers by country. Premium Spanish Language Domain Names ending in .com are now recognized around the world. They convey instant credibility and prestige for anyone searching for information, products or services related to the category defined in the domain name. Firms all over the world, regardless of country of origin use .com domain names. 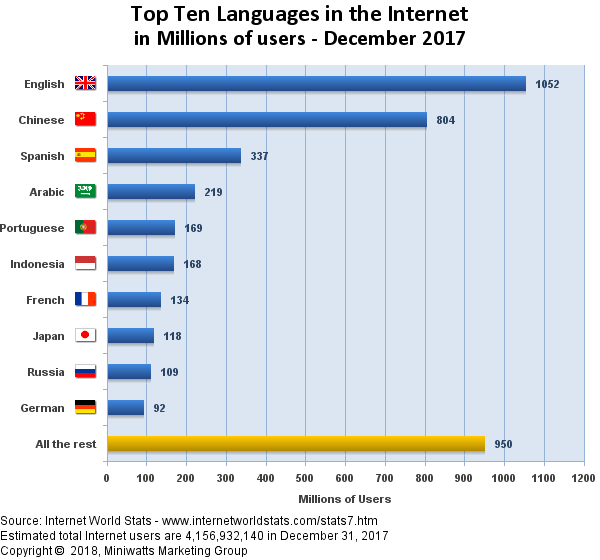 This allows businesses to position them to the 42+ million Spanish speakers on line in the U.S. and the 337 million online worldwide as of December 2017; up from 131 million Spanish speakers on line worldwide in January 2009. This is a 250% increase in only 8 years. This trend suggests the dynamic nature of the Spanish language market online today. The chart to the left shows the number of Internet users in select Latin American countries. There is still abundant room for growth in this market due to the great numbers of Spanish speakers who have yet to come online. In short, Premium Spanish Language Domain Names are extremely brand able and easy to remember they are powerful investments for reaching the 460+ million native Spanish speaking people worldwide. Mexico has the largest population of any Spanish speaking country; over 110 million persons. Therefore a company using a Spanish Language Domain name marketing strategy may reach a huge population of Spanish speakers just south of the U.S. border. In Spain like in Mexico the .com extension is used with frequency. Many Spanish businesses choose .com domain name extensions instead of or in addition to the country’s .es extension. Of Spain’s 47 million Spanish speakers, 75% or 40 million were online by June 2017. Businesses with an international profile would do well to consider Spain as part of evaluating a Spanish Language Domain Name strategy. From 2000 to 2009 Internet use grew 670% in Latin America; in just 9 years. Internet penetration was just 34% as of the end of 2009 indicating lots of room for increased growth. 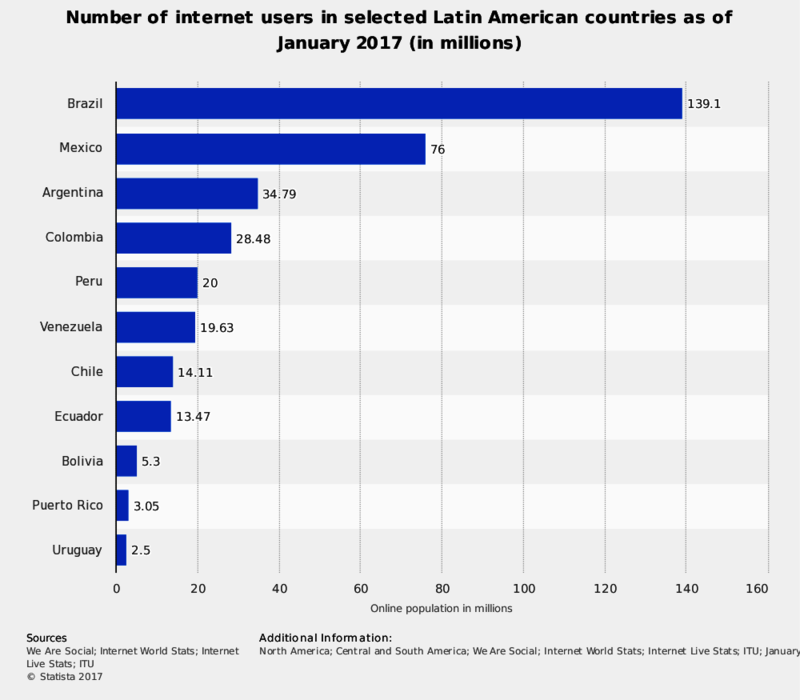 As Latin American internet penetration has increased in recent years so has the number of overall users. 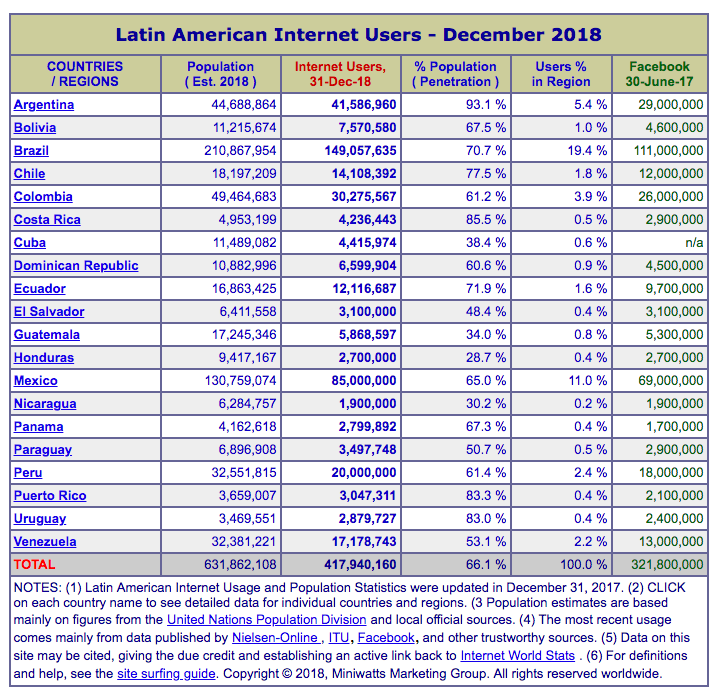 The chart below shows the number of Internet users projected as of December 2018 in Latin America at 417 million of a total Latin America population of 631 million; a 66% penetration rate. This rate almost doubles the penetration rate of 9 years ago. The market opportunity is abundant and will increase as penetration rates and overall Latin American population continues to rise. In some cases Portuguese and Spanish nouns mean the same thing and are spelled the same way. A common example is “banco” which means “bank” in both Spanish and Portuguese. There are approximately 273 million Portuguese speakers in the world and 83 million of them are already on line. For domain names that are the same in Spanish and Portuguese, this is an opportunity to serve dual markets.